It was such an honor to photograph her when we were in Asheville recently. This woman who I have watched over the years, has grown into the confident and successful business woman that I now know and she is inspiring AF and kind and a lot of fun! And, I am SO happy I did!! Because within minutes, three women responded and Janet was one of them. From that point forward, it was kind of an understood practice that the first night before our retreats that happened each quarter, all three of us would do the Indian restaurant in Asheville! What fun and love and connection! And so, the next day on the first day of the retreat, Janet and I sat together up front while Christine Kane started the experience. I think we were both terrified, sick, happy and excited by all of it as we knew so hard what changes were about to happen! Janet and I were partners through a lot of the exercises during that retreat and many others that followed and we both watched and encouraged each other’s growth. There were tears, laughter and probably even some ‘leave me alone and let me hide’ moments as we would dig deeper into our “stuff”, both business and personal. Lots of plans were laid out in those days and months and years and we saw the growth. The expansion. The love. The compassion. The truths. It was a beautiful thing. I wouldn’t trade it for the world. And so as I got my own footing as a photographer in that first year (which was about 5 years ago! 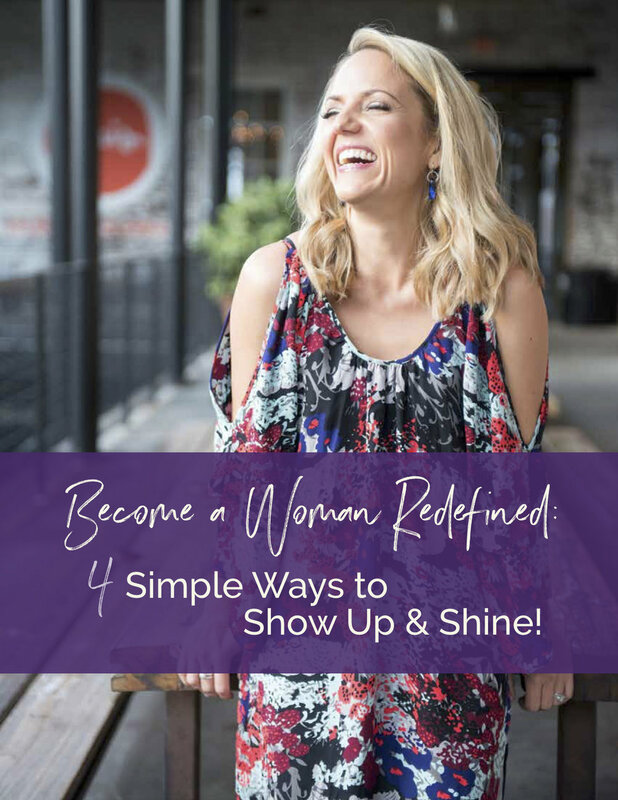 ), I started doing Woman Redefined sessions bare bones. My coach helped me out the first time by offering her gorgeous office space -- didn’t take any BS excuses from me and said, ‘just do it’ and so I did. And the women started to show up. I photographed Janet a few months after that “raw beginning” and by then, I had elevated to at least getting makeup done for my clients at a local place in Asheville and then we photographed on the streets in town. It was actually so much fun and I will never forget her first ever shoot with me. Guitar in hand, colorful clothes on and the most amazing smile and attitude in check, we had the best time! And honestly, nothing has changed, thank goodness! So when Janet came back to me this year, I was beyond honored that she wanted to work with me again! And this time, I felt so much more “grown up”. My business had changed. I mean, my LIFE had changed and I was a different woman and business owner and it was exciting! I pride myself on working with women and not just taking a picture, but getting to know who they are and how they want to show up in the world and expand and connect and capture their ESSENCE! There is nothing better than a client that trusts you and knows you have watched her grow and can truly see her light as she shines even more brightly today than the day you met her 6 years ago! 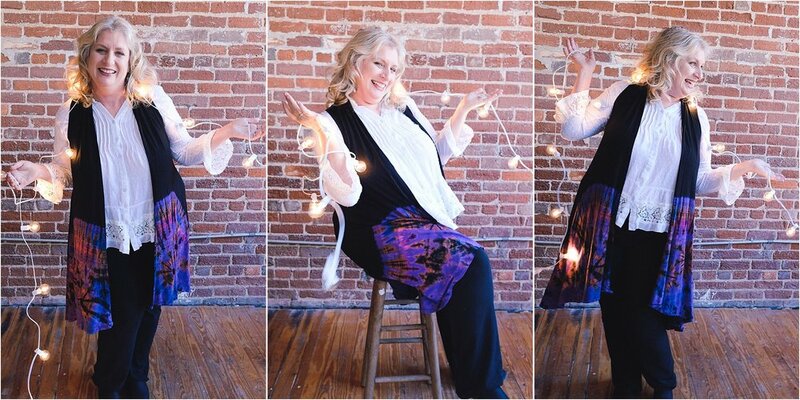 So this time, as Janet and I planned her photo shoot, we talked a lot about how she has been going through some powerful shifts which have led her to major growth and awareness in both her personal life and business. Her songs reflected this shift and it was quite magical! Check out her songs, Home and Real Again! We talked about how all of this was lighting her up in big ways and we (all) know that when this happens to a woman, WE can see that light, that brightness, that bold badassery and it is an amazing thing! And the beauty was that Janet herself was seeing her own light, too!! And embracing it! This time though, we did a branding session to really capture expansion — personal and professional. And her growth is so perfectly evident. And so, this week, Janet is my featured Woman Redefined. And wow, she has come a long way baby! From hustling hourly wage jobs and barely getting by to creating a badass business that includes music-inspired retreats to Ireland, producing her new album (you know I’ll share it when it goes live! ), to holding adult guitar retreats and teaching adults guitar courses, she has created that dream that we cried about 5 years before at our first business retreat together! ﻿To really hear her voice and feel her bright light as she sang the beautiful and powerful words of her new songs for an upcoming album as we played in the studio in Asheville that week is a gift that I’ll treasure. This is the magic I live for in my work. This image series is a super favorite series of mine that we created in the studio this past week. My intuition told me to grab the box of fairy lights that I had at the house (and so without questioning it, I DID!) and take them with me ... and before I knew it, our friend, Anne, who was hanging out with us that day, placed them over Janet's shoulders and then it was all about laughing and playing and me capturing that joy! Sometimes silly, sometimes serious, but ALWAYS Janet -- kind, loving, generous of spirit and soul -- I can't say enough about this woman who has now been a friend for years! I am pretty sure you have smiled and nodded through this post if you know her, especially if you know her! And if you don't, I have a feeling they will make you laugh and smile and you will feel her energy because, well, that is Janet! I love you my friend and I am honored to have been able to be there to witness you truly showing up and owning your beautiful badass self! !